Here’s the fourth alpha card we’ve released. It’s for Vadik Nabotov–from Broken Wolf. And look for more of Vadik, coming in the Courts of Draiochta series from Camryn Rhys and Krystal Shannan. 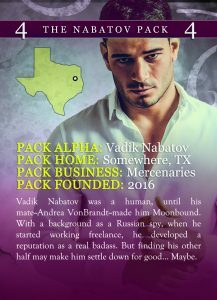 To get Vadik’s card in the mail from us at Moonbound Books, you can click here.